Italians arrived in Toronto in large numbers during the early 20th century. Italians first settled in an area then known as The Ward, centred around University Avenue and College Street. By the 1920s, most Italians had moved west of Bathurst Street and the College-Clinton area had emerged as the city’s major Little Italy. The affordable Edwardian homes that line the side streets of this neighbourhood were bought by Italian immigrants, many of whom found work on the railways and in road construction. Italians started businesses on and around College Street Little Italy has also become popular with young people because of its vibrant nightlife and its proximity to the downtown core. Since the 1980s, many young professionals have bought homes in the neighbourhood. A tourist attraction of the area is the Italian Walk of Fame. Granite and brass stars line the sidewalk with the names of noteworthy Italians. At Clinton Street, on the north side, is the Royal repertory cinema, which was recently renovated and has an upgraded projection system as it is used for movie editing purposes during the day and repertory cinema in the evenings. While the commercial units are dominated by cafes and restaurants, there are numerous other small businesses serving the neighbourhood. The side streets are mostly detached or semi-detached single family homes dating to the early-1900s Edwardian period, with front porches and smaller lots, as was the custom at the time. It was during the 1920’s that College Street’s ‘Little Italy’, became recognized as the residential and commercial centre of Toronto’s Italian community. However, by the 1960’s, many of Little Italy’s residents began to move north to the the Corso Italia district on St. Clair Avenue West. The Italian families that moved out of Little Italy were replaced by Portuguese, Chinese, Vietnamese and Spanish families. This mix of cultures gives Little Italy the international flavour that it enjoys today. 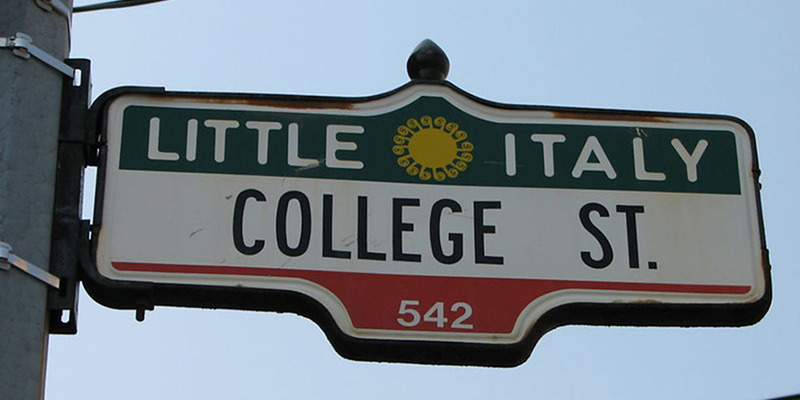 In 1985, the local business association on College Street officially adopted the Little Italy name in recognition of the role this neighbourhood has played as the starting point for Italians in Toronto. The majority of Little Italy’s row-houses and attached Victorian homes were built between 1880 and 1910. These houses are set on narrow tree-lined streets with parking facilities located at the back of the property, off a rear laneway. (P) Kent Senior Public School, 980 Dufferin St.
(P) Kent Senior Public School, 93 Margueretta St. The Little Italy shopping district on College Street, between Shaw Street and Euclid Avenue, features authentic Italian restaurants and European fashions. The Portugal Village shopping district on Dundas Street includes fresh fruit and vegetable markets, mouth-watering bakeries, as well as seafood restaurants, and cafes that feature an authentic Portuguese cuisine. The West End YMCA at 931 College Street, includes a gymnasium, a swimming pool, and community meeting rooms. The First Portuguese Canadian Cultural Centre at 722 College Street, has recently undergone a major renovation/expansion. The centre’s facilities include lecture halls, a games room, a bar, meeting rooms, and a restaurant. Evening programs range from performances of Fado music to dances. The College/Shaw Public Library serves as a community meeting place and offers reading material in a number of languages, that reflect the general population of the area. Little Italy is well served by regular bus routes on Ossington Avenue, and streetcar service on College Street, Dundas Street, and Bathurst Street. Motorists are within ten minutes of the Gardiner Expressway and Lake Shore Boulevard.